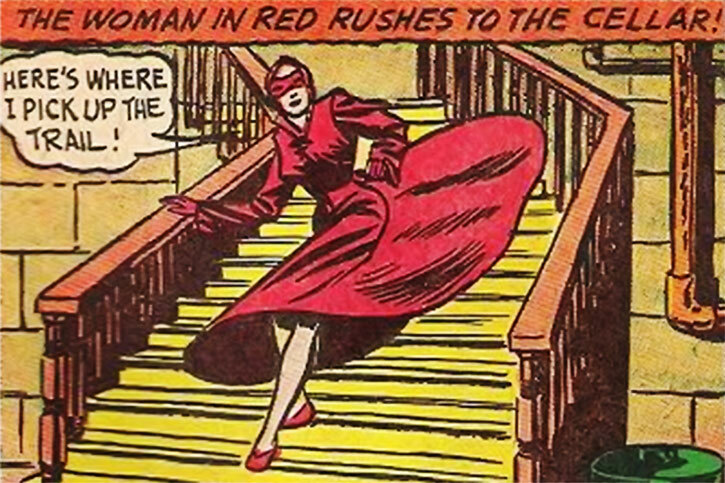 The Woman in Red appears in 1940, in Thrilling Comics. 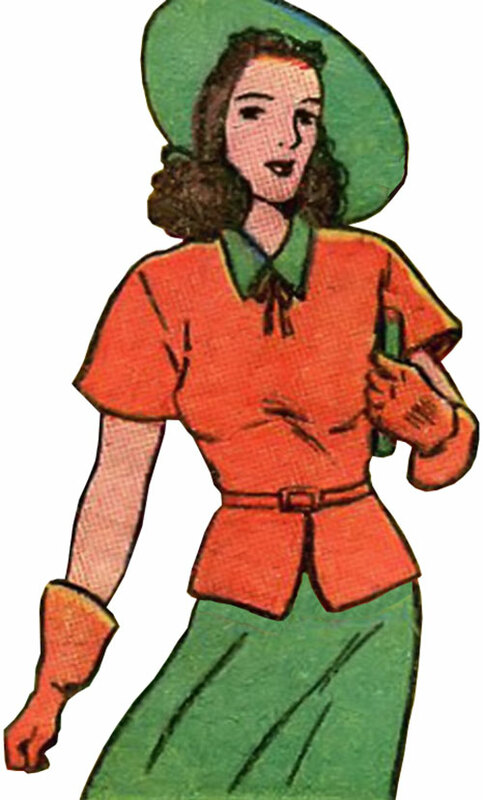 She can reasonably be called the first super-heroine in US comics, in the sense that she had a code name, a mask and a costume. Trina Robbins says so, and she knows way more about this than I do. I couldn’t read Thrilling Comics #29, 31, 32, and 44 – but according to Michelle Nolan’s Nedor index (PDF) only #29 has a WiR story. Thus this entry covers all of period Woman In Red appearances but one. Base Of Operations: An unspecified large American city during the 1940s. Height: 5’6½” Weight: 125 lbs. Eyes: Brown Hair: Originally brown, later blonde. The Woman in Red starts with a specific concept. 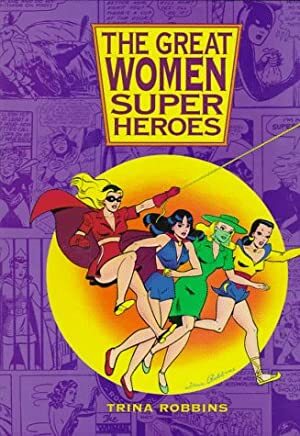 But then, like most 1940s characters appearing in anthology titles, she gets handled by a variety of anonymous writers who do not maintain continuity about events, characterisation and capabilities. The “strong state” are her early appearances, and later stories in the same style. The “weak state” represents the majority, but not all, of her appearances over 1942 and the second half of 1941. The “two-fisted state” represents her 1943 appearances. It’s essentially a different character. Peggy Allen has an excellent deductive intelligence, which she puts to good use as a detective. She’s also taller than most women of her generation, knows some judo and/or jiu-jitsu, and is an accurate and experienced gunfighter. 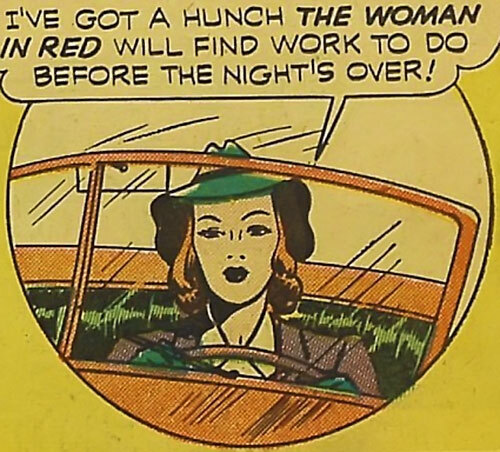 Being a modern woman, she can drive (hey, 1940 remember ?) and owns a big roadster – it looked a bit like a late 1930s Ford Phantom or Roadster. The Woman in Red is observant and decisive, and not afraid to get into fights. She doesn’t seem particularly athletic – except when it comes to swinging on ropes and similar manoeuvres. That, she does like a regular Johnny Weissmuller . Peggy also seems to be familiar with scientific matters and detective techniques, and probably has a solid education. Given the genre conventions of the time she’s probably a upper class person, “explaining” her innate superiority. Miss Allen has studied the police files, and can recognise the face of many career criminals in the city. Peggy isn’t a police officer, but an “undercover worker”. She doesn’t seem to have any law-enforcement authority, and police detectives do not particularly trust her even if they know she’s an undercover police operative. The abilities of the weak take on the Woman in Red are modest. She isn’t particularly perceptive, fast or tough. Even an ordinary man stands a good chance of overcoming her physically. However she can still shoot straight and do ordinary detective work, and has more experience than her opponents do. She also still has her knack for swinging on ropes. This version of the character was also on much better terms with the police, who knew that she was an ally. 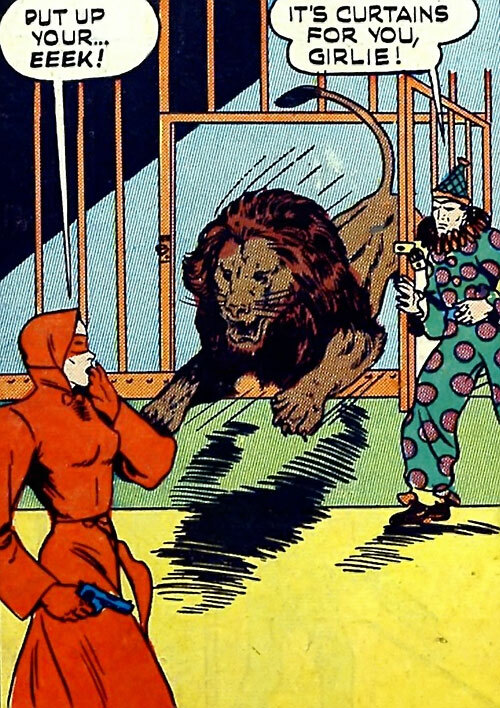 Since in either take she’s easily ambushed and none too durable, the Woman in Red gets knocked out with alarming frequency during her investigations. However, she always fully and quickly recovers from being clubbed or choked unconscious. Then she carries on as if nothing of note had happened. That being clubbed on the head is no big deal is a common genre convention of 1940s comics. But this happens so often that a superhuman power of recuperation is necessary to model this in game terms. Furthermore, she often recuperates faster than her foe had anticipated. Allen usually operates with a small-calibre compact pistol, along the lines of a .380 Colt Pocket Hammerless (in later stories) or a Walther PPK (in early stories). Though .380 ACP (aka 9mm Kurtz, among others) is underpowered compared to combat handgun rounds, it is consistently depicted in the stories as capable of killing large men in one shot. It can even puncture tyres and send cars crashing. The Woman in Red once used another self-defence weapon — a trick fountain pen with a dose of tear gas — provided by the police. She’ll usually have whatever very minor equipment is convenient, such as a flashlight, an amazingly sharp nail file, or tweezers (to handle clues). Wearing period women’s shoes and a dress reaching her mid-calves doesn’t hinder her in the slightest when it comes to running around or performing her Tarzan-like acrobatics. 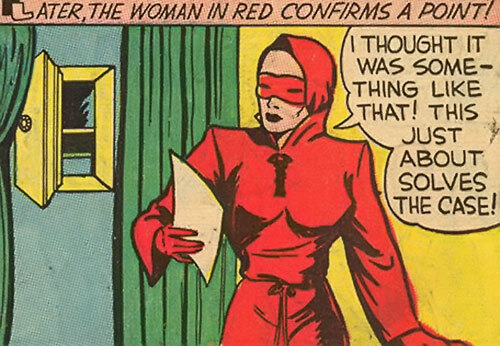 This version of the Woman in Red has a different costume, reminiscent of the one worn by Miss America (Joan Dale). Also, she is more of a rough and tumble troubleshooter. Though she’s not the equal of a Golden Age action hero, she’s very strong and martially adept. This is reinforced since most of her opponents are incompetents who can be beat up by any red-blooded citizen of the great American democracy. This version of the Woman in Red can break plumbing by kicking it (whilst wearing heeled court shoes, no less), or sink a small boat by throwing a fire ax at it. She uses martial arts punches and kicks as well as soft techniques, though she’ll feel obligated to point out that these jiu-jitsu techniques are the only good thing Japan ever brought to America. She also inexplicably turns out to be a qualified single-prop airplane pilot. This version wasn’t seen much. 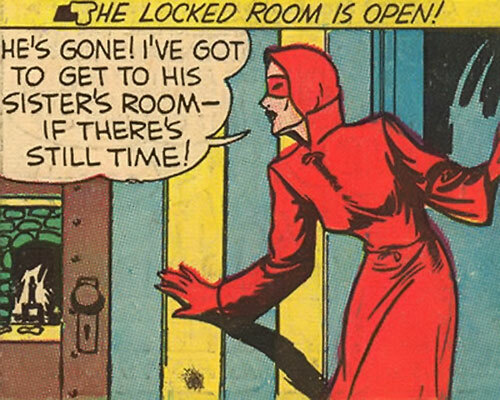 By that point, the Woman in Red no longer was in every issue of Thrilling Comics. Peggy Allen is a skilled undercover police agent. She works in an United States metropolis during the 1940s – perhaps New York City. She is a personal friend of the Commissioner, who regularly has her investigate cases of interest — sometimes just because she asked him to. Allen doesn’t conduct undercover infiltration in the modern sense of the term. What she does is using thin cover identities (usually as some sort of nurse, a maid, a secretary or perhaps a journalist). Her advantage is that most people don’t pay serious attention to women and do not expect women to be detectives. 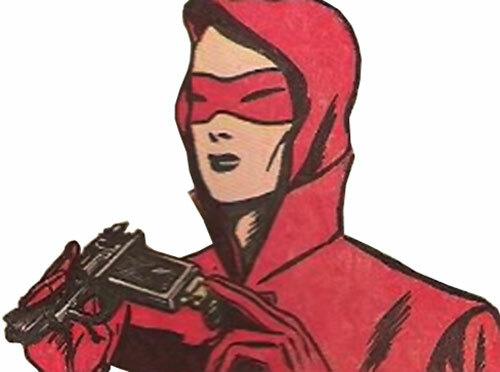 Peggy also operates with a mask and a costume, as the Woman in Red. This serves to maintain her thin cover while running around where a nurse or maid isn’t supposed to be. The downside is that the police often assumes that she’s some sort of criminal who should be held for questioning. The bumbling Inspector Daugherty (whose name later switches to Cavanaugh), in particular, is a recurrent if ineffectual thorn in the Woman in Red’s side. 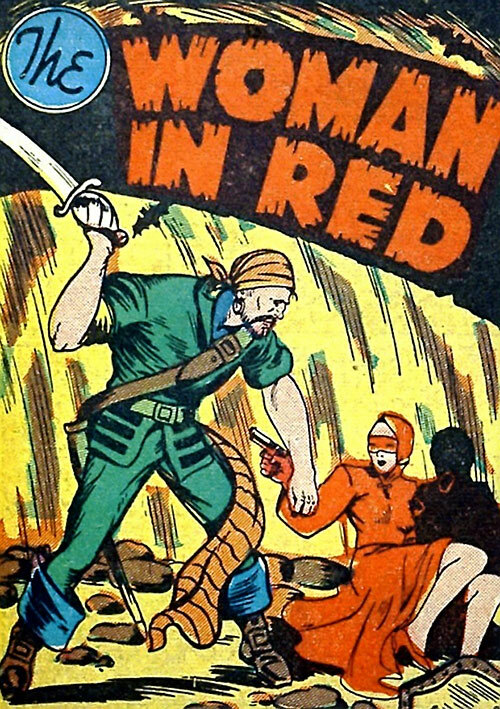 By 1942, though, he becomes more of an ally and occasionally an asset – until he eventually becomes the cavalry whenever the Woman in Red is in trouble. 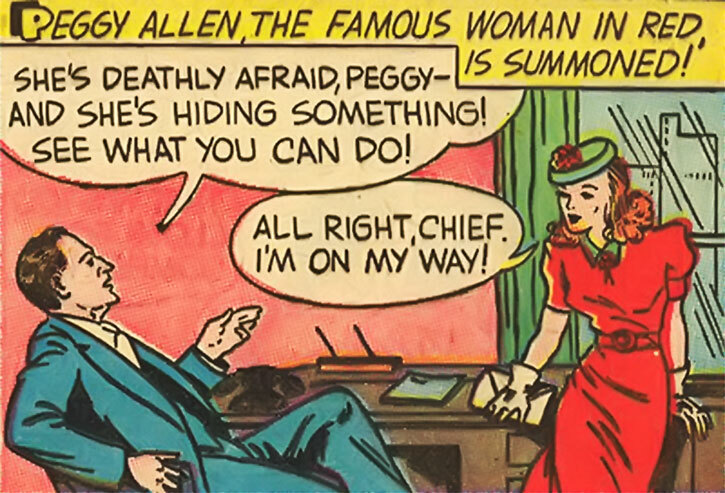 Starting in 1942, the police knows who she is and even Cavanaugh learns that Peggy is the Woman in Red. Being the Woman in Red also allows Miss Allen to ignore red tape and civil rights, since she never identifies as police. 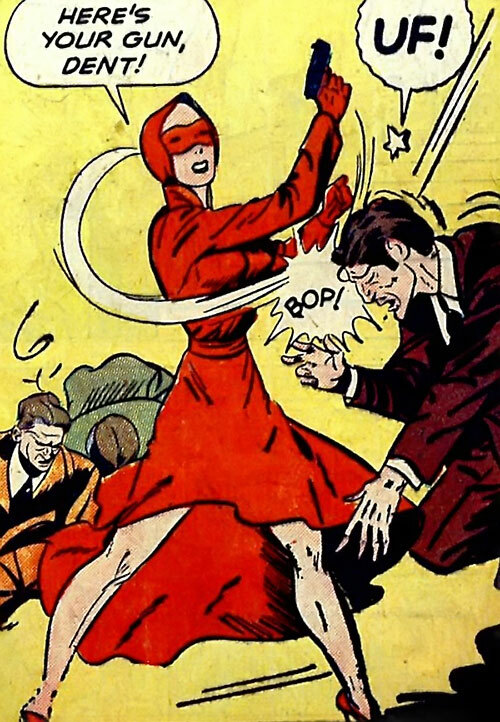 The Woman in Red is regularly presented as being famous, and many people know that she is some sort of crime-fighter. Even when the police doesn’t. The Woman in Red was active from 1940 to 1945 and possibly beyond. She exposed numerous murderers, saboteurs, traitors, thieves, etc. Established that a crime wave at the Metropolitan Hospital — involving multiple murders and the theft of a fortune in radium — had been masterminded by one of the doctors. He coveted the superintendent’s job and wanted him fired in disgrace. Uncovered the murderer stalking the Valery heirs in their father’s grange. It turned out to be their lawyer trying to embezzle the Old Valery fortune. Unmasked a bogus but murderous “spirit” racketeering the participants of a seance. Determined that the lethal “curse of the African Voa” was but a sham to cover an inheritance murder plot. Unmasked the Black Terror stalking the Central Museum of Art, who was the curator’s assistant. Exposed the ingenious plot used by the gangster Scalponi to eliminate a rival by trapping a corpse. Discovered that Mr. Parsons, supposedly an insane murderer locked up by his sister, wasn’t the one killing the Parsons family members. Established that the murders at the luxurious Metropolis Hotel were committed by the former owner and the night watchman to discredit the new owner. Proved that noted actor Perry Knight wasn’t a murderer, and had been framed by a theatre’s owner. Determined that a Dutch jewels broker wasn’t trying to smuggle a stolen gem in the US. He had instead been captured by Nazis ! (though they’re not yet clearly identified as such). Discovered the identity of the phony “killer ghost” Black Ned, despite all clues pointing toward another man. And it would have worked too, if not for this meddling Woman in Red ! Established why three Hindu assassins had plied their trade at the Central Library after a rare book had been broken out of storage, and on whose orders. Proved that the man sabotaging an ammunition plant supplying the Army wasn’t a disgruntled worker, but an ambitious inventor wanting to sell his rifle design. Exposed a Gestapo agent armed with a poison pen. He was trying to steal jewels that had been smuggled from Europe to the US. And so on, and so forth. 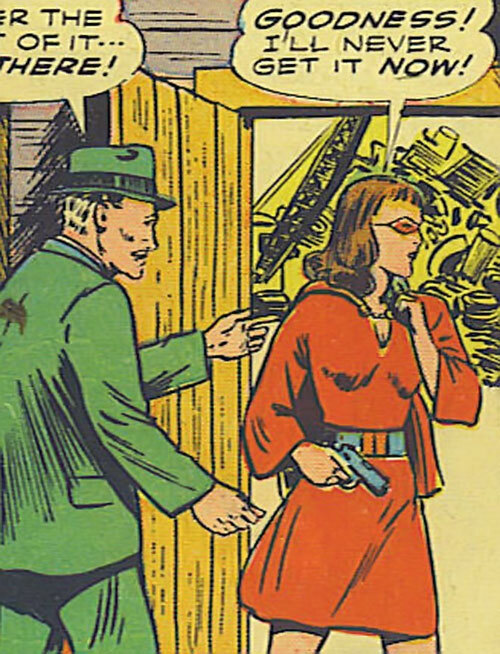 Her adventures from 1940 to 1942 tend to stick to this formula, but with the 1943 changes she becomes more of a patriotic troubleshooter thwarting inept Axis agents in the US and gangsters, in typical wartime short comics stories. 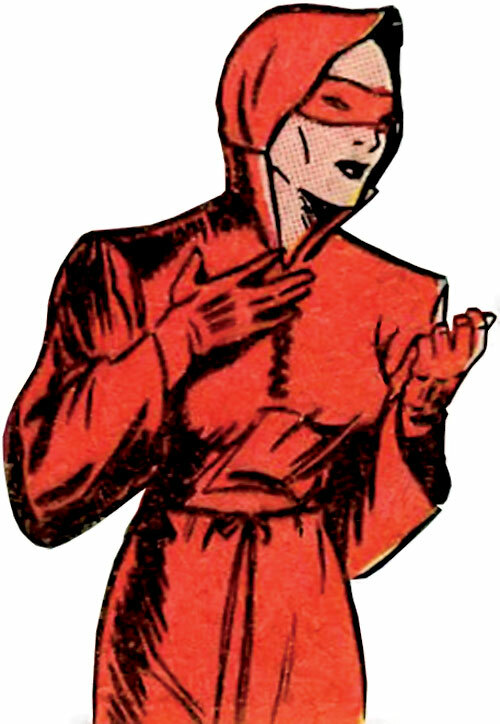 As the pre-1943 Woman in Red, she wears a red cloak with a hood, red shoes, red gloves, and a red domino mask. Her hair is held back and hidden by her hood, which almost makes her look bald. As Peggy she is dressed in modern 1940s upper middle class urban fashions. Though her Woman in Red clothing looks like a sort of hooded dress, it is actually a red cloak with buttons down the front, plus a red sash around her wasp waist. It thus can be quickly donned on or off above her normal clothing. Peggy Allen harbours some hostility toward chairs. When debriefing the Police Commissioner, she’s thus usually sitting on his desk. One infers that she adopts a different voice as the Woman in Red, since people who talked to Peggy Allen never recognise her as the WiR. 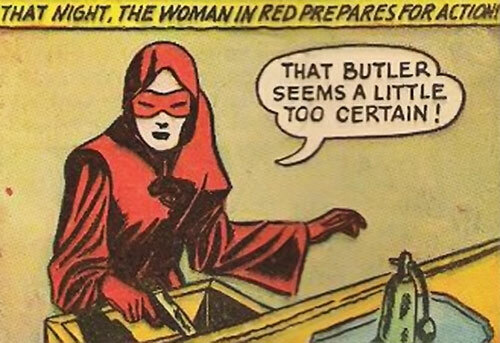 By 1943, she’s back to being a brunette and has a new costume with a red dress and a short red cape. Like with most 1940s comics there wasn’t much characterisation. 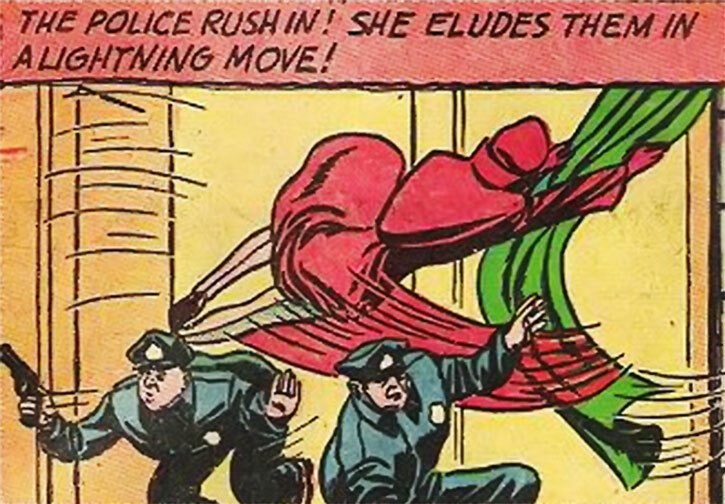 But the Woman in Red seemed to be a dynamic go-getter, eager to bring justice to innocents and confound criminals. She’s also interested in dates with hot upper class guys. By late 1941, she starts indulging in the occasional bad pun, for instance as the punchline of the story or to mildly taunt opponents. 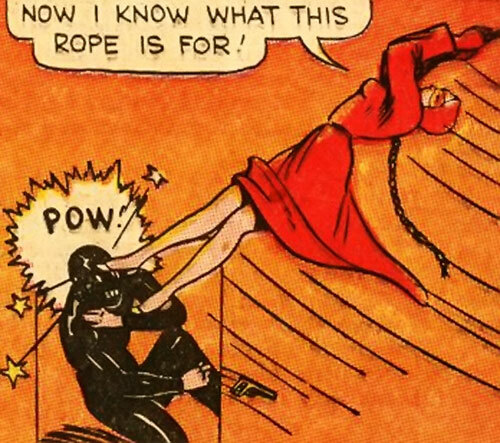 The Woman in Red acts like a 1940s vigilante, not like any sort of police. She’ll not go out of her way to kill people, but when that happens it’s no big deal. Breaking and entering is her bread and butter, and she has little qualms threatening witnesses to force them to talk. The Woman also routinely roughs up police trying to arrest her so she can escape, but she’ll use soft unarmed techniques to do so. In 1943 she’s a standard patriotic super-hero. The Woman in Red would totally be Jean DeWolff’s mother. 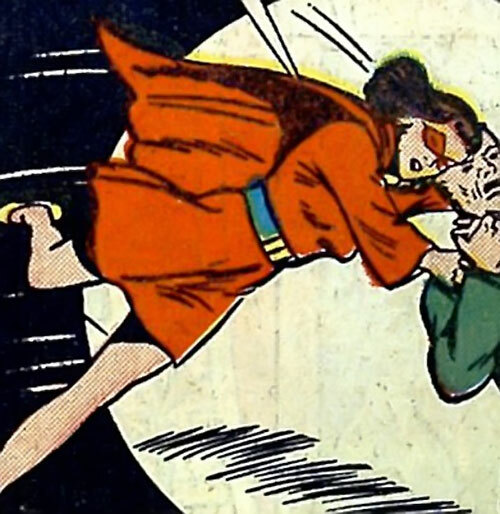 Some find it difficult to resist the temptation to have her be Barry Allen’s aunt, whose wartime exploits inspired him to become a Man In Red as the Flash. Regeneration doesn’t allow for healing destroyed tissues beyond normal human capabilities. Credentials (Police, Medium), Familiarity (Police investigation techniques, Physical sciences, Nursing, Housework, Secretarial work, Police files on usual suspects), Schtick (Safety rope), Misc. : Peggy Allen is affiliated with the police department, but doesn’t have a rank. Walther PPK [BODY 03, Projectile weapons: 04, EV 01 (03 w/STR, 04 w/Martial Artist), Ammo: 06, R#03]. Small utility knife, not useable for combat, and other minor bits of equipment as convenient. Trick fountain pen with a dose of tear gas [BODY 01, AV 06, Chemical attack: 04, Ammo: 01]. Only deployed during early adventures. Credentials (Police, Medium), Familiarity (Nursing, Housework, Secretarial work, Police files on usual suspects), Schtick (Safety rope), Misc. : Peggy Allen is affiliated with the police department, but doesn’t have a rank. .380 Colt Pocket Hammerless [BODY 02, Projectile weapons: 04, EV 01 (03 w/STR), Ammo: 07, R#03]. Buddy (Inspector Cavanaugh), Credentials (Police, Medium), Familiarity (Police investigation techniques, Physical sciences, Nursing, Housework, Secretarial work, Police files on usual suspects), Police Rank (Special Agent), Schtick (Safety rope). A very mild Secret Identity. Nail file that works like an utility knife, and other minor bits of equipment as convenient. Source of Character: Thrilling Comics issues published by Nedor/Standard/Better/etc. during the Golden Age. Helper(s): Sean MacDonald, Darci, people who do paper scans of these now-public-domain books (so much easier to read than microfiches). Writeup completed on the 20th of December, 2013.